This is an outfit for a lovely daytime walk at beach on summer holidays, on a careless day and far from all everyday duties. Bumbag is great piece of accessory to bring along for the walk, all your necessary items are in hand when you need them but you have your hands free. You can really play with the accessories on holidays, when the look doesn't have to be official. Now it is also right time to take out all your marine inspired accessories. In summer their materials can also be something else than just metal and leather. To balance the look bracelets can be worn on wrist opposite the bumbag side. Also all outfits should be comfortable during summer days and what could be even more careless than a summer dress - a play suit, simple and easy! Hairstyle and make-up can be as natural as possible which goes best with this look. Plaits are the easiest way to keep you hair in order in salty sea wind and at the same time they give chic yet natural impression. With colourful nail polish you can add a bit of a kick to otherwise light summer look. Flip-flops finish the hot-day-look, flat canvas slip on shoes are great on a little bit over cast day. 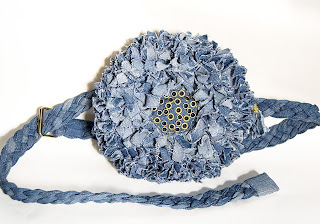 Limited number of these bumbags made from recycled pair of jeans is available in Heli's online shop in July and August. Great look and I've seen this hip bag up close and it is a pure genius. So cleverly made.